I had three opportunities to change hats from "antique dealer" to " vintage bootlegger" this past week. All three adventures were new ones for me--which makes them extra special-and a bit amusing. #1- A dealer/picker we know offered us the opportunity to purchase numerous oil paintings. After repeated attempts to get together--our only option was to met at our huse, before church for us and a charity golf game for him. So--before the sun was up--he drove his car to our house-backed it up to our vehicle--and we unloaded 20 boxes of paintings into ours. All that was missing was me blinking a flashlight on and off--and jumping out of the bushes with a box of hooch. #2- There has been a run on the yard signs of Our Political Candidate of Choice--and none to be found in our area. I went to a town 1.5 hours from here--where Our Political Candidate of Choice's Running Mate is from and located the campaign office. It was in a quite isolated downtown area--many gray dark buildings--except for this office. I walked down a dark hallway-wondering if I was in the right place--and stepped out into a well lit office buzzing with activity and music playing. All that was missing was the clinking of glasses and three knocks on the door "Bugsy sent me!" #3- Gould's fresh apple cider is legion around these parts. 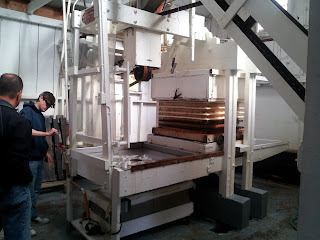 At a farm in rural Elburn Illinois, this vintage farm presses fresh cider for a few weekends each year. No additives-no pasturization--just a medley of apples put in a huge press and gallons and gallons and gallons of crisp juice fed into vats. We parked higgelty piggelty on the grass and walked into a rustic clapboard building and lined up. Bring your own jug and get a 50cent discount. Otherwise--you get to the counter-- where a smiling Pendleton plaid bedecked young woman gives you a sample of cider and asks "How many would you like?" "Three gallons, please." It takes a few minutes as she opens the tapper and the carmel colored liquid fills the jug. "It takes awhile so it does not foam up" she says. All that was missing from this adventure was the huffing and puffing copper piped still around the corner. Best part of the cider is--it freezes well. Not sure if real bathtub gin freezes.